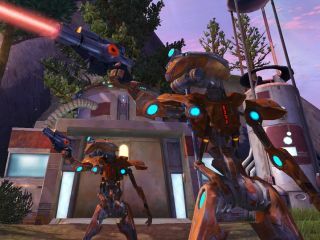 The MMO that could finally shake the dominance of World of Warcraft is still a year away, with Star Wars: The Old Republic scheduled for Spring 2011 at the earliest. World of Warcraft has beaten down all challengers for its MMO crown, but the spectre of a decent Star Wars MMO is attractive. However, those that hoped BioWare's SW: TOR, announced in 2008, would make it into the 2010 games list are going to be disappointed. "While we have not announced a specific date, we can confirm that we are targeting a spring 2011 release for Star Wars: The Old Republic," said Bioware's Sean Dahlberg on the SW:TOR official forum. "We've got a lot of exciting updates and reveals planned throughout 2010, including the first-ever hands-on testing for the game," he added. The news comes just a day after the games publisher EA's boss John Riccitiello announced a major MMO for the Spring 2011 period, sparking rumours that The Old Republic was a year away.